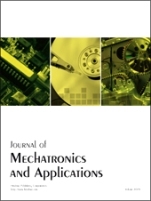 Journal of Mechatronics and Applications (JMA) aims to provide an international forum for original research work in the areas of mechatronics and embedded systems focusing on theoretical and practical aspects of mechatronics. The journal fosters the synergetic integration of mechanical engineering with electronics, software engineering, intelligent control, and embedded systems in the design and manufacturing of industrial products and processes. It also aims at promoting information exchange and discussions on all aspects of mechatronics systems that would lead to the development of mechatronics system technologies in the areas of engineering, environmental, management, medical, economical, and societal issues.